A video footage showing a teenager breaking the glass door of a church in Tura has gone viral in social media with wide spread condemnation. The teenager was spotted in CCTV camera of Hawakhana Baptist Church in Tura town kicking the glass door of the church late Saturday midnight. 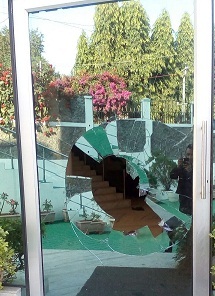 The video clip shows that a boy kicks the glass door of the church, while the other boy trying to stop him. The church is situated opposite the Tura government college and the incident took place around 2 am. Superintendent of police West Garo Hills Raghuvendra Kumar however brushed aside any communal motive behind the incident. He said, “This is an act of an inebriated youth and there is no communal or ulterior motive behind it”. The church authorities have also confirmed that there is no ulterior motive behind the incident. Police is further investigating the matter. This is for the first time that such an incident has taken place during Christmas celebration in the hill town of Garo hills. Interestingly, Meghalaya Chief Minister Dr Mukul Sangma and his ministerial colleague Clement Marak are also members of the Hawakhana Baptist Church. Meghalaya is a Christian dominated state and the spirit of Christmas is very high there. Christmas is being celebrated across Garo hills with pomp and gaiety.